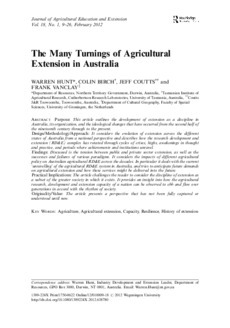 Purpose: This article outlines the development of extension as a discipline in Australia, its organization, and the ideological changes that have occurred from the second half of the nineteenth century through to the present. Design/Methodology/Approach: It considers the evolution of extension across the different states of Australia from a national perspective and describes how the research development and extension (RD&E) complex has rotated through cycles of crises, highs, awakenings in thought and practice, and periods where achievements and institutions unravel. Findings: Discussed is the tension between public and private sector extension, as well as the successes and failures of various paradigms. It considers the impacts of different agricultural policy on Australian agricultural RD&E across the decades. In particular it deals with the current ‘unravelling’ of the agricultural RD&E system in Australia, and tries to anticipate future demands on agricultural extension and how these services might be delivered into the future. Practical Implications: The article challenges the reader to consider the discipline of extension as a subset of the greater society in which it exists. It provides an insight into how the agricultural research, development and extension capacity of a nation can be observed to ebb and flow over generations in accord with the rhythm of society. Originality/Value: The article presents a perspective that has not been fully captured or understood until now.